Fairline 50 1990 Flybridge Motor Yacht. 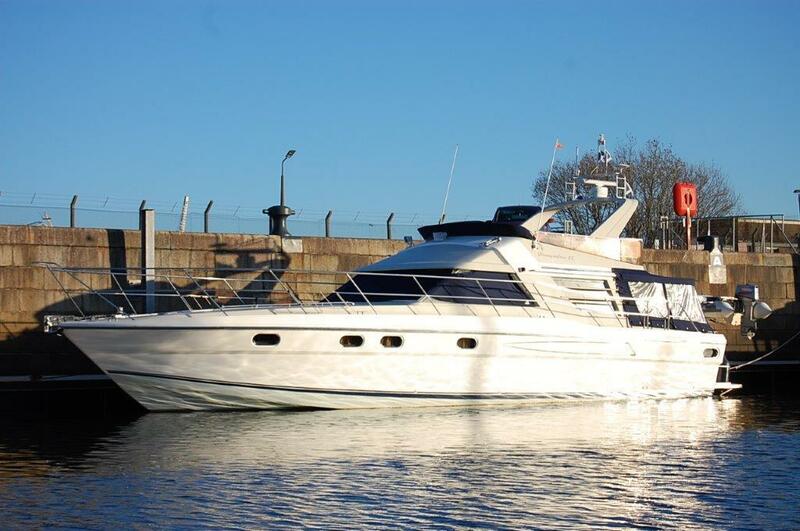 This is a beautiful example of this iconic Motor Yacht from Fairline Boats. Powered by twin Volvo Penta 122D 480hp diesel inboard engines on shaft drives. This is a must see Motor Yacht. Length at Waterline: 49' 4"
There are 12 volt electrics throughout supplied by two banks of 12 volt batteries which in turn are charged by the engine alternators. A 240v shore power supply with ring mains is also fitted and has an inline battery charger. 7.5kw HFL Generator is installed and links to ring main and charger facility. There is accommodation for up to eight persons arrangement from forward. Forward stateroom has King size Island berth dressing table and en-suite heads. There is also good hanging and stowage space. Guest cabin to Port side with twin bunks. Guest cabin Starboard side twin size cabin and berth. Galley down to Port side. Helm position in saloon to Starboard side twin seat and instrument displays + controls. Saloon is large spacious area with seating to Port and Starboard side. Large aft cockpit with wrap round seating. Crew cabin and large lazarette locker. Flybridge with helm controls and seating with table aft end of flybridge. If you would like more information about this Fairline 50, please get in touch using the contact details below, or alternatively by using the contact form on the right.